The Georgian Terrace is the perfect romantic backdrop for a wedding of grandiose proportions or small and intimate. After all, it was good enough for the Gone With the Windgala so all that romantic juju is probably still lingering in the halls of this historic Atlanta hotel. 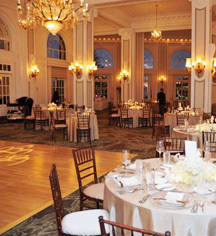 The Grand Ballroom is ideal for a reception with floor-to-ceiling windows, crystal chandeliers, two outdoor terraces, and of course, the main feature, the historic architecture. The Piedmont Room works well for both receptions and cermonies and of course, the Mitchell Room. The Mitchell Room is the most intimate room for a wedding in The Georgian Terrace and is also bathed in natural light. 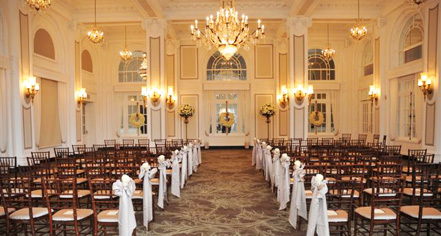 Wedding venues at The Georgian Terrace can accommodate anywhere from 25 to 250 guests. The wedding coordinators on staff will do everything from guiding the tours of the wedding venues to guiding the choice of the menu for the big day. Check out floor plans, capacity charts, and a list of preferred vendors.